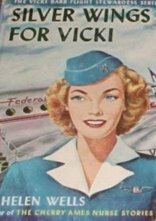 Reading Vicki Barr books is a look back at the glamorous days of air travel. Since I am a flight attendant myself, I enjoy looking for similarities to flying today. 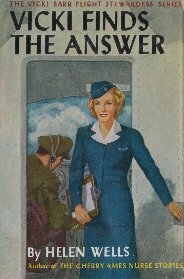 The first two books in the series, Silver Wings for Vicki and Vicki Finds the Answer are wonderful depictions of beginning stewardesses' life. From the cattle call interviews to the "dorm" life of a shared apartment, these books capture the excitement and glamour of the job. In the search for the missing twin, Vicki's hectic flight schedule takes her from New York to Chicago to Boston to Memphis and more as she tries to solve the mystery in between work assignments. She finally has to take vacation days to keep on the trail of the missing twin. I enjoyed the book because it showed how Vicki combines her job of flying with her hobby of solving mysteries. Many real flight attendants use their flying privileges to their own advantage this way. I myself, get to scour used bookstores from coast to coast for Girl's Series books. One of my favorite examples of how little the airline industry has changed is from The Silver Ring Mystery. Vicki and her Friend Jean, Prepare their Electra Turbo-prop aircraft for an emergency landing and everything they do is much the same as we do it today. They select "able-bodied" passengers" to assist at the door and window exits and they brief all the passengers on the locations of the exits and the brace positions. That section of The Silver Ring Mystery could have been lifted from my emergency manual today. Vicki is very valuable as a flight attendant because she speaks Spanish and French fluently. Like Nancy Drew, there seems to be nothing that Vicki cannot do! She learns to pilot a plane and she can eat as much as she likes without gaining weight. Something that is very important for a flight attendant, especially in the old days when we had weight checks. When I read Vicki Barr, it reminds me of what the job of flight attendant is supposed to be like. So many things about air travel have changed in the past few years, but the excitement of being in one city today and across the country tomorrow is still there.